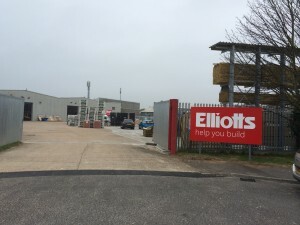 Elliotts is one of the oldest family run builders merchants based along the south coast. They are continually expanding and improving so when they wanted to open a new branch in Christchurch, HMF were only happy to help. HMF designed the entire build as Main Contractor. The site was formerly the Revo Castor factory in Airfield Way, Christchurch. The work included a significant strip out of mechanical & electrical services that were part of the Revo factory. The external works included providing a new concrete hardstanding c/w drainage to enable the yard to be utilised efficiently with fork trucks & have different types of racking to suit the various materials Elliotts stock. The racking systems provided by HMF included cantilever hot dipped galvanised wood racks, 6.5m high c/w roof canopies to enable large bundles of wood to be stored space efficiently & safely. 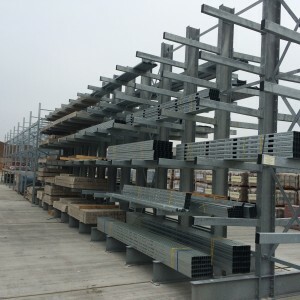 Adjustable cantilever lintel racks were designed & fitted again in HDG finish to resist the external elements. Pallet racking was provided c/w pallet support bars to enable different sizes of pallet/unit loads to be stored with good selectivity. The internal works included structural modifications with new steelwork & building works. This included a knock out panel diamond cut into the existing structural floor & trimmed by HMF with additional supporting steelwork. This knock out panel was decked out with wooden joists & chipboard flooring to enable a staircase/atrium to be fitted in the future if required with minimal disruption to the internal operations as well as mess caused by dust etc. A self-selection trade counter area was designed by HMF c/w offices, trade counter & shop gondolas. This area was diamond ground by HMF & had a 2 coat epoxy floor paint applied. New LED lights were fitted up directly onto the existing concrete floor. HMF employed diamond cutters to discretely drill small holes up through the structural existing concrete floor to enable the cabling for these lights to be fed through an existing raised access floor instead of having unsightly trunking running between the lights. Slatwall was fitted with bespoke graphics along one side of the self-selection area. HMF also provided & fitted window bars to all the existing round & first floor windows to enhance security. The main warehouse was fitted out with various forms of storage equipment including vertical PAR racks, moulding racks as well as general pallet racking. A new restroom/kitchen area was built by HMF c/w relocated water services & power modifications. 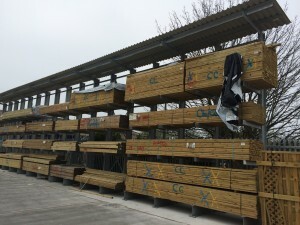 A new joist cutting area was also provided to enable Elliotts to cut 13m long joists to house builders’ requirements which HMF provided cantilever racking, longspan shelving & small parts shelving for. The site has already been an operational success & looks very impressive.